Lighting is the key to make the viewer believe to look at a realistic scene. Ambient light: light from an unspecified source. Back light: light that adds depth and dimension by creating highlights. Distant light: light that is cast evenly throughout a scene with shadows all in the same direction. Fall-off: the attenuation or decrease in brightness the further from the light source. Fill light: the light that brightens dark areas and softens shadows from the main light. Point light: light that shines in all directions from a central spot. Spot light: focusable light that is aimed in one area. Photometric web: a 3D representation of the light intensity distribution of a light source. Web light: approximates real-world light distribution using a 3D representation of the light intensity. Web lights can be created only if the LIGHTINGUNITS system variable is set to 1 (American lighting units) or 2 (International lighting units). Attenuation: the fall-off in brightness the further from the light source. 0: No lighting units are used. Enables generic lighting. 2: Enables International lighting units: Lux. DEFAULTLIGHTING (Default lighting): A distant light that follows the view direction. This setting can be different per viewport. 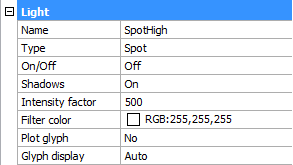 0: Default lighting is used if no lights are switched ON. 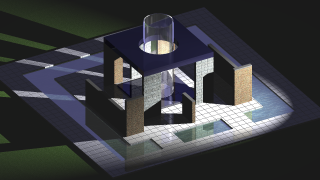 1: Default lighting is used instead of the light sources defined in the drawing. LINEARCONTRAST (Linear contrast): Specifies the ambient light intensity. Values between -10 and 10 are accepted. A value of -10 results in maximum ambient light. A value of 10 results in no ambient light. LINEARBRIGHTNESS (Linear brightness): Specifies a scaling factor for the light intensity. Values between -10 and 10 are accepted. The default value is 0 (no scaling). Negative values decrease the light intensity, positive values increase the light intensity. This setting can be different per viewport. Name: a user defined name for the light. Type: defines the type of light: spot, point, web or distant. On/Off: specifies whether the light is turned on or off. Shadows: specifies whether the light casts shadows or not. Turning shadows off to increases performance. Intensity factor: multiplies the Lamp Intensity property, the result is the Resulting Intensity. Filter color: defines the color of the light. Plot glyph: if on, the light glyphs are plotted. LIGHTINGUNITS = 1 (American units) or 2 (International units). Resulting intensity: the product of the lamp intensity and and intensity factor. Lamp color: defines the inherent color of the light or color temperature in Kelvin or standards. Resulting color: this is the final color of the light: a combination of the lamp color and the filter color. 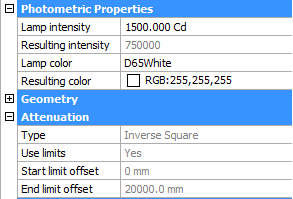 Photometric web: If the light type is Web, Photometric Web and Web offsets are available (not implemented yet). Position: controls the location of the light. Targeted: switches the target property on/off. In the real world, an object appears darker if it is farther away from the light source. The attenuation properties define how the light diminishes over distance. Attenuation does not apply to photometric lights. An alternative method to control the distance a light shines is the use of limits, which define the points from where a light starts to shine and where it stops. Using limits decreases the time needed to calculate the illumination of a scene. 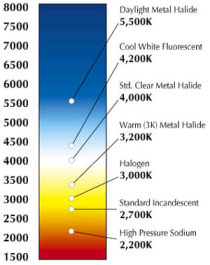 Attenuation properties apply to spot lights and point lights. None: no attenuation. The distance to the light source has no influence. Inverse Linear: the attenuation is the inverse of the linear distance from the light: at a distance of 2 units from the light source, light is half as strong; at a distance of 4 units, light is one quarter as strong. Inverse Square: the attenuation is the inverse of the square of the distance from the light: at a distance of 2 units, light is one quarter as strong; at a distance of 4 units, light is one sixteenth as strong. Use Limits: if this property is set to Yes, the Start limit offset and End limit offset fields become active. Start limit offset: defines the point where the light starts to shine, measured from the center of the light. End limit offset: defines the point where the light stops to shine, measured from the center of the light. The Attenuation properties apply to generic lights only (LIGHTINGUNITS = 0). Inverse square attenuation is applied automatically for photometric lights ( LIGHTINGUNITS = 1 or 2). Type: Sets the shadow type. Sharp (raytraced): generates sharp edged shadows. 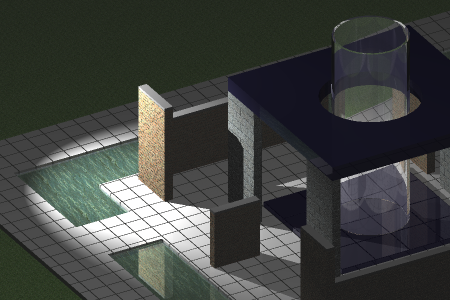 Soft (shadow map): generates realistic shadows with soft edges. 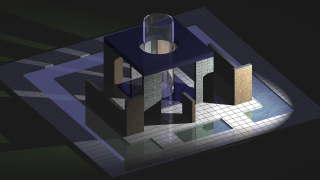 Map size: specifies the amount of memory for shadow calculation. Click the field, then select a value in the drop-down list (64/128/256/512/1024/2048/4096). Softness: sets the softness of the shadow map. Enter a value between 1 and 10. When a surface is illuminated by a spotlight, there is an area of maximum illumination (hotspot) that is surrounded by an area of lesser intensity (falloff). The difference between the hotspot angle and the falloff angle defines the area of lesser light intensity. 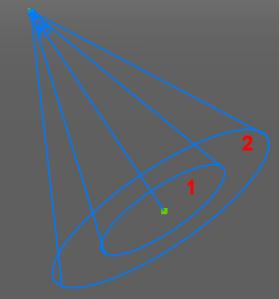 If the falloff angle and the hotspot angle are almost equal the edge of light cone is rather sharp (left). The greater the difference between both angles, the softer the edge of the light cone (right). Click the Light List... button ( ) on the Lights toolbar. 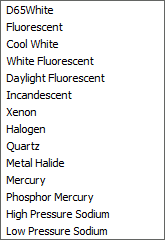 Choose Drawing Explorer > Lights in the Tools menu. Type lightlist or LL in the command bar, then press Enter. Closes the Drawing Explorer - Lights dialog, then guides you to the creation of a new light in the drawing. Closes the Drawing Explorer - Lights dialog and selects the light's glyph in the drawing. The properties of the light display in the Properties Bar. Click to switch light off. Click to switch light on. Type light in the command bar, then press Enter. Choose a light type in the prompt menu. Określ położenie źródła w rysunku. Wpisz współrzędne położenia źródła w pasku poleceń i naciśnij klawisz Enter. Naciśnij Enter, aby zaakceptować domyślne współrzędne. Określ położenie docelowe w rysunku. 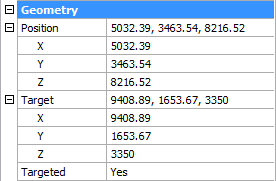 Type the coordinates of the target position in the command bar and press Enter. Select Name in the prompt box. Type N in the command bar and press Enter. Type a name in the command bar and press Enter. Press Enter to accept the default name. Click a light property in the prompt menu. Type the capitalized letter of a light property in the command bar and press Enter. You are prompted to define the selected property in the command bar. It is not possible to define a web light if the LIGHTINGUNITS system variable is zero (No lighting units). Select the light in the drawing. If the Properties bar is not open yet, double click the light. Rozwiń grupę ustawień, w razie potrzeby. 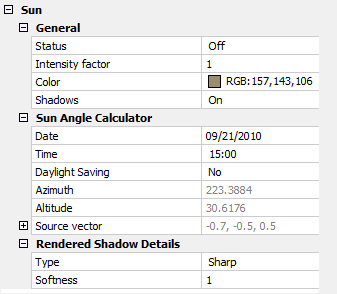 Click the Sun Properties... tool button ( ) on the Render toolbar. Type sunproperties or sun in the command bar, then press Enter. 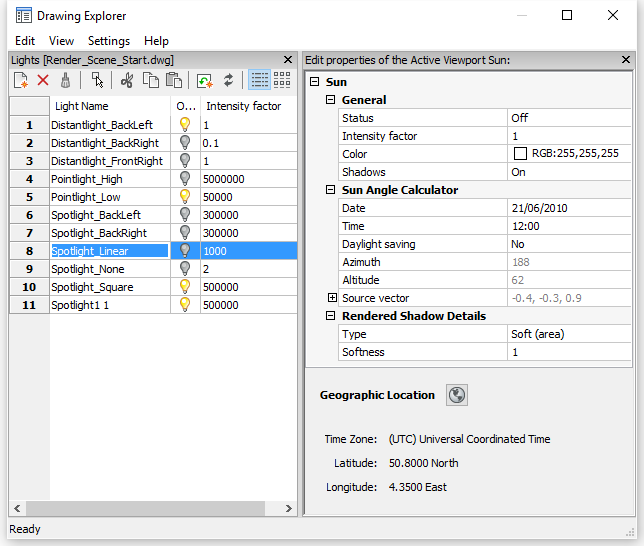 The Drawing Explorer - Lights dialog displays, showing the sun properties in the Editor pane. When LIGHTINGUNITS = 1 or 2, the Color property of the sun cannot be edited. Click the Geographic location... tool button ( ) on the Render toolbar. Naciśnij przycisk Lokalizacja geograficzna... ( ) w panelu Edycja okna Eksplorator Rysunku - Światła. Type geographiclocation or geo in the command bar, then press Enter. 2. (option) Check the Store geographic location information in drawing option. 3. 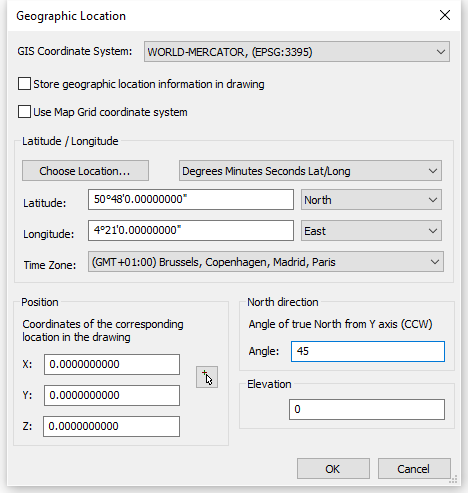 (option) Check the Use Map Grid coordinate system option. Type the latitude and longitude of the location in the Latitude and Longitude fields and select the appropriate hemisphere for each setting. Click the Choose location... button, then select a city and timezone and click the OK button. 3. 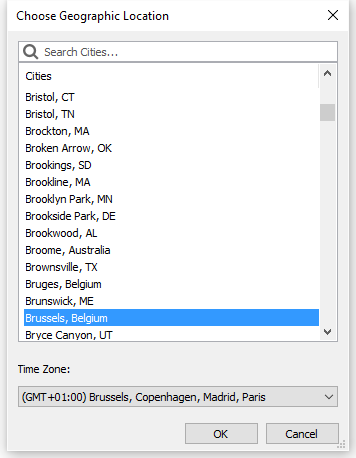 (option) If you did not select a time zone in the previous step, choose a time zone in the Time Zones list. 4. (option) Specify the Coordinates of the corresponding location in the drawing.